Greetings! Nothing makes me want to blog more than when I stumble across a really nice carton of ice cream. I also love the fact that Stone Ridge is always trying to be more than just a cheap economy level store brand product. Wait, that sounds like a insult, but no matter! Where is my new friend? Ahh, there he is. 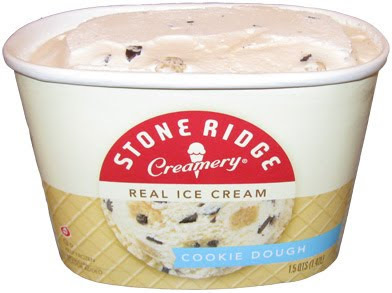 Stone Ridge Creamery's Cookie Dough real ice cream. Look at the container carefully for a second. Now, what don't you see? Usually to the right of the red logo, you would see a description of the ice cream. Sure it could just be a mix up, but I'm thinking ....maybe, just maybe, it's on purpose. I know, sounds like a conspiracy theory, but follow me on this one. 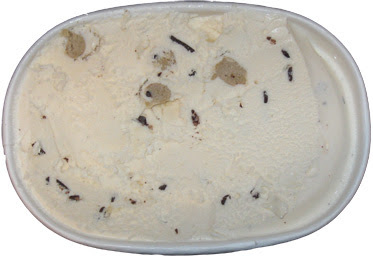 So, you see a fairly average looking cookie dough ice cream.We have some decent sized cookie dough bits, but since this is an economy brand, there's just enough of them. There's also a good helping of chocolate chip bits (though not so obvious from this picture). Past Stone Ridge products have taught me not to expect a ton of bits, but that doesn't mean they have to be low quality. The first thing I tested was a cookie dough bit. It tasted just fine and got me all revved up to dig in. Remember, I said there is no description on this container, and I think that it's because this isn't your standard cookie dough bits mixed into some boring vanilla ice cream. Oh no, Stone Ridge has gone down the same road that our friends at Turkey Hill have chosen. The base ice cream has a nice mild cookie dough flavor to it. Now I'm not 100% sure that's the best way to describe it. To be honest, I want to say this: The base ice cream is light and fluffy, yet has this mild cookie dough flavor and grit to it. Grit seems like such a negative term, but really, it hit the mark for me today. Cookies are a tasty textured treat, and it's nice to get that subtle vibe here. We've been trying to clean out the freezer and I was dying for something new and exciting, and this just nailed it right on the head for me. No, it doesn't taste like cookie dough flavored whip cream (aka Oberweis), instead it's light and refreshing. It's not heavy (and thankfully not gummy either). I like it, I really do, I'm glad Stone Ridge is around to mix things up a bit. have been looking for the low fat cookie dough ice cream .but cannot find it anywhere did you stop making it. It is the best. I have to eat low fat and I don't eat any other ice cream and was the very very best. Bought this ice cream recently. Love it!! !